Richard Tolman was Professor of Physical Chemistry and Mathematical Physics at California Institute of Technology (1922-1948). Other institutional affiliations included University of Illinois, Urbana-Champaign, University of California, Berkeley, and Massachusetts Institute of Technology (MIT). His research interests included statistical mechanics and thermodynamics. March 4, 1881Birth, West Newton (Mass.). 1903Obtained BS in Chemical Engineering, Massachusetts Institute of Technology (MIT), Cambridge (Mass.). 1903 – 1904Studied at Technical Institute of Berlin. 1904 – 1910Assistant Technical Analyst (1904-1905); Instructor in Theoretical Chemistry (1907-1909); and Research Associate in Physical Chemistry (1909-1910), Massachusetts Institute of Technology (MIT), Cambridge (Mass.). 1910Obtained PhD in Physical Chemistry, Massachusetts Institute of Technology (MIT), Cambridge (Mass.). 1910 – 1911Instructor in Physical Chemistry, University of Michigan. 1911 – 1912Assistant Professor of Physical Chemistry, University of Cincinnati. 1912 – 1916Assistant Professor of Physical Chemistry, University of California, Berkeley. 1916 – 1918Professor of Physical Chemistry, University of Illinois, Urbana-Champaign. 1918Chief, Dispersoid Section, Chemical Warfare Service, United States, Army. 1919 – 1921Associate Director (1919-1920) and Director (1920-1921), Fixed Nitrogen Research Laboratory, United States Department of War. 1921 – 1922Director, Fixed Nitrogen Research Laboratory, United States Department of Agriculture. 1922 – 1948Professor of Physical Chemistry and Mathematical Physics (1922-1948) and Dean, Graduate School (1935-1946), California Institute of Technology, Pasadena (Calif.). 1940 – 1946Vice Chair, National Defense Research Committe (1940-1946) and Chair, Armor and Ordnance Division, National Defense Research Committee (1941-1942), Office of Scientific Research and Development. 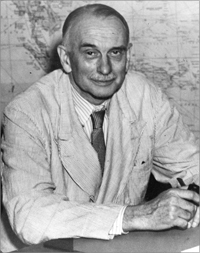 1942 – 1946Chief Technical Advisor to General Leslie Groves, Manhattan Project. September 5, 1948Death, Pasadena (Calif.). Advised by Tolman at California Institute of Technology, "Investigation of reactions sensitized by optically excited mercury vapor. The specific heat and entropy of hydrogen chloride derived from infra-red spectra." PhD advisor at Massachusetts Institute of Technology (MIT), "The Electromotive Force Produced in Solutions by Centrifugal Action." Professor of Physical Chemistry and Mathematical Physics. Obtained PhD (1910). Assistant Technical Analyst; Instructor in Theoretical Chemistry; and Research Associate in Physical Chemistry. Director, Fixed Nitrogen Research Laboratory. Associate Director and Director, Fixed Nitrogen Research Laboratory. Assistant Professor of Physical Chemistry. Chief Technical Advisor to General Leslie Groves. Chief, Dispersoid Section, Chemical Warfare Service. Vice Chair; and Chair, Armor and Ordnance Division. Richard C. Tolman papers, 1735-1958. Albert Einstein speeches [sound recording], 1932-1933. George Placzek papers, 1934-1955, undated. Lorenz D. Huff papers, 1928-1948. Lorenz D. Huff student lecture notes, 1928-1931. Office of Scientific Research and Development [OSRD], 1939-1950 (bulk 1939-1947). Oral history interview with Allan Sandage, 1974 May 16. Oral history interview with Allan Sandage, 1977 February 8. Oral history interview with Charles F. Richter, 1978 February 15-September 1. Oral history interview with Frank Oppenheimer, 1984 November 16. Oral history interview with H. R. Crane, 1973 March 28 and 1974 June 18. Oral history interview with Hermann Bondi, 1978 March 20. Oral history interview with Homer J. Stewart, 1982 October to November and 1993 November 3. Oral history interview with J. Robert Oppenheimer, 1963 November 18 and 20. Oral history interview with Jesse Leonard Greenstein, 1974 July 31. Oral history interview with Linus Carl Pauling, 1964 March 27. Oral history interview with Linus Pauling, 1984 May 10. Oral history interview with Martin Schwarzchild, 1977 September 27. Oral history interview with Milton Plesset, 1981 December 8. Oral history interview with Philip Morrison, 2002 December 19 and 20. Oral History interview with Robert F. Bacher, 1986 February 13. Oral history interview with Seth H. Neddermeyer, 1984 May 7. Oral history interview with William Alfred Fowler, 1972 June 8, 9, 1973 February 5, 6, and 1974 May 30. William F. Meggers home movies [motion picture], 1927-1957. The theory of the relativity of motion / by Richard C. Tolman.